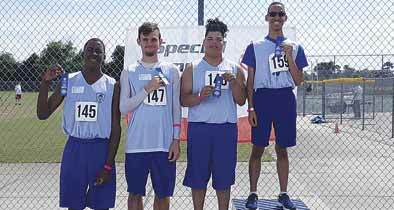 The Apopka High School Special Olympics team participated in the Area 7 Special Olympics Summer Games on Saturday, March 30, at Wekiva High School. The 4×100 relay team won one of Apopka High’s 23 first-place awards. The AHS athletes also won seven second places and three third places. Members of the relay team shown are, (l-r), Shemar Merriweather, David Brabham III, Alexander Laureano, and Williams Alford. Wekiva baseball played Lake Minneola on Friday April 12.